Planting season is upon us, and if you’re a gardening novice, stunning planters aren’t always to come by. Thankfully, experts have some guidelines for success that can help almost everyone plant the perfect pots! The recipe? Thrillers, fillers and spillers! Thrillers: Thrillers are the centerpiece of the container and give the pot structure. They usually have height and visual interest and they bring the eye up! Typically, this includes things like grasses or ferns. This should be what you build the rest of your planter around. Fillers: Fillers are flowering plants. Impatients, petunias, marigolds, and geraniums are all good choices. These plants add color and fill out as they grow to create a lush look as they mature throughout the season. Spillers: Spillers are plants that cascade down the container as they grow to soften the edges. Well-chosen spillers will create a lush and balanced planter, and they add contrast, color and texture that complement the other plants. Think asparagus ferns, ivy, and creeping jenny! 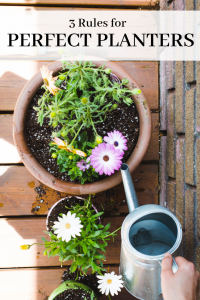 Be sure to also consider the drainage of your containers, and whether the plants will receive sun or shade. This will impact which plants you choose! With a strategic plan, you’ll have gorgeous containers that will thrive this summer!